Preheat oven to 400 F degrees. Prepare a pizza dish or a large baking sheet with parchment paper. Cut your cauliflower into roughly chopped florets. Steam the cauliflower until tender. Place the eggs, 1 cup of cheese, oregano, garlic and salt and pepper in your food processor. Mix everything together. Add the florets to your food processor and pulse until cauliflower resembles rice. 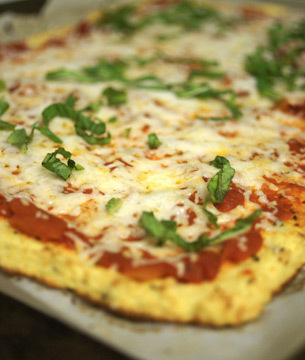 Place onto the prepared baking sheet and shape into either a pizza crust, or a rectangular shape for the breadsticks. Spread thin! This is one of the secrets to having your crust turn out. If it is too thick the moisture can not evaporate in the oven and you will have a soggy crust. yuck! Bake the crust (no topping yet) for about 25 minutes or until nice and golden and not soggy. Once golden, sprinkle with remaining cheese (and other toppings of choice if making pizza) and put back in the oven for another 5 minutes or until cheese has melted. If making pizza, this may take a little longer. Note: If making pizza, I prefer it WITHOUT the tomato sauce as this adds extra moisture and can make it soggy.